AnxioCalm has been well studied. Containing a specialized plant extract standardized to unique compounds, AnxioCalm has been compared to other anxiety-relieving substances in research. It not only met or exceeded the effects of the compared substances, it did not cause drowsiness - a common effect of many other approaches. 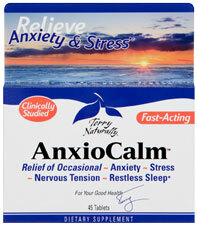 AnxioCalm was tested with volunteers experiencing increased stress and nervous tension. A standardized questionnaire was used to measure their feelings of anxiety before using AnxioCalm, and compared their responses on 1,3, and 7 days after taking the specialized extract. Recommended Use: 1 tablet twice daily for occasional use. For aggressive support, 2 tablets twice daily. May take 2 tablets at bedtime to support restful sleep. Q: Isn’t Echinacea for the immune system? Q: The dosage seems low to me? Why not simply take more? Q: What makes this ingredient different?